..so they dance! : The two Meeras. With so many films produced in India per annum, movies with the exact same titles are bound to happen. Sometimes it's a coincidence, other times it's a reworking of the same story. In this case, the Hindi film Meera from 1979 has absolutely nothing to do with the Tamil film Meera from 1992. The only thing they have in common is the fact that I have viewed them both. The films directed by the lyricist and writer Gulzar are usually wonderful, unique and paced like a lengthy poem, moving slowly but lyrically. Meera is a story of a Rajput princess (Hema Malini) who only has love in her heart for the Hindu god Krishna. The story is of course based on the legend of Mirabai, a Hindu saint. Vinod Khanna portrays her husband, who struggles with Meera's devotion to loving Krishna. When I first saw the film, I was enthralled. Hema Malini's beauty and presence capture Meera's absolute faith, the sets and costumes look regal, the music is fitting hymns and Vinod Khanna (the first I ever saw of him, in fact) blew me away as a man conflicted in his caring for Meera and bafflement of how all-encompassing her faith is. The movie moved with the pace of a slug but I didn't fast-forward a single second in spite of the fact. It's difficult for me to see Hema Malini, my absolute favourite Hindi actress, critisized, though I admit that while a favourite, she is not the best actress, certainly. Her performance in Meera and many others has been called stony, stoic to a fault, and while I can see where the criticism comes from, I disagree. She is probably better at livelier characters, but Meera comes off as silently strong, which I love, and having read the legend (though not claiming to be an expert on it), it strikes true for me. Of course, the real find in this film, when I first saw it and even after some rewatches, is Vinod Khanna. Not only is he perhaps the most attractive actor of his time (to me anyhow), he possesses this magnificent pull that draws so much attention away from Meera's struggles for her faith to the character of Rana and his inner turmoil. So, where the Hindi Meera is fascinating, memorable and by all means a recommended film, the Tamil film by the same title from early 1990's is none of those things. I hear it's universally regarded as crap, and after having seen it, I can conclude this to be true. P.C. Sreeram's debut direction opens with a young woman named Meera (played by Ishwarya) wanting to give birth at her former school. Why? She will tell you, in a film-long flashback. Long story short, she met a guy named Jeeva (played by Vikram, my reason to watch the movie), hated his guts, then got into a world of trouble, ran away from home and he accompanied (and by accompanied, I actually mean stalked) her, to help her out of that world of trouble and such altruistic things. The movie is, plain and simple, really bad. Jeeva comes off a jerk who takes liberties at touching Meera (back off buddy, she's just not that into you) and Meera is pretty much hysteric throughout the entire movie. First because she hates Jeeva, then because she loves him. The songs are bizarre and cheesy, and the violence is laughably gruesome. I fast-forwarded every single scene with the villain, it was simply that bad. Vikram's acting is not good, but then, I suppose in a role like this, how could it be. Ishwarya's acting, on the other hand, is sufficient but does not improve the movie. Number one saving grace of the movie is Vikram occasionally looking very nice. Number two saving grace of the movie is my own appreciation for the most bizarre, puzzling song picturizations. Like the one where the heroine is bathed by an elephant, after being shown dressed in drag. If you can find logic in that symbolism, please tell me. Or why this college generation celebrating song has this sort of choreographies? Or why the hero plays the heroine like a violin in one song? I am genuinely curious. Of course, it could simply be that there is no inner logic to these things, and the director has simply thrown in whatever he thought might sell. It doesn't save this film from being mostly a trainwreck, however. The boring villain, the ridiculous violence, the unsympathetic love story and a couple of peculiar plot twists all add up to not much. Watch it drunk, or don't watch it at all. You're probably better off with the latter, unless a huge Vikram enthusiast such as myself. So there you have it. Two movies called Meera and it should be no surprise to anybody which comes out on top. Of course, views may differ. Any fans of the Tamil Meera are free to stand up and voice their disagreement; in fact I would be interested in hearing whether it really is universally regarded as crap. Similarly, I'm sure Gulzar's film will not be everybody's favourite; it is far too slow-paced for a portion of viewers. "bathed by an elephant, after being shown dressed in drag"??? omg- i will trust u and wont even try to see this! 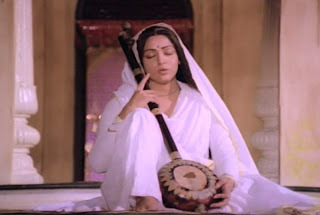 In Meera, I remember feeling seriously sorry for Vinod Khanna's character - there he was looking drop-dead gorgeous and Meera prefers a stone statue! Historically speaking though, the story isnt authentic. The real Meera was widowed at a young age and as a widow she had no option but to be devoted to God. Shweta - Emailed. Also, nooo, I have seen Vinod in plenty of others. It's just that Meera was the first film I saw with him in it. But that was back in 2006 or something. Since I've seen around 10 films with him. I also adore his son. Funny how that works. Bollyviewer - Thanks for the historical correction. I read the story after I first saw the movie, so details are admittedly quite fuzzy. As for other Meeras, IMDb lists four - the remaining two are Tamil films from the 40's, which may be very good for all I know (and based on the actual legend). So if you can get your hands on those oldies, I would definitely check them out. It's only the 1992 one you need to avoid. I thought she did calm and quiet really well as Seeta in Seeta aur Geeta. I can't think of any other quiet roles I've seen her in, though. If you are such a fan of Vinod Khanna then I recommend that you definitely watch "Imithan" - a kind of desi version of To Sir With Love but with its own bollywood twist. Vinod Khanna did a real good job - not only handsome but acted well too. Kajol's mom Tanuja was the heroine in this 70s movie. The movie is famous for its songs too. i had seen hema malini's meera and i think that it a very good movie its a very good team effort and work of hema ji is like i don't have words for her , she has a quite spiritual face so this kind of role suites her and i was speechless for some time after completion of this movie. You gotta be kidding me. Two Meeras and you picked that 1992 crap for comparison? What a shame that you didn't make any efforts in looking for 1945 MS Subbulakshmi Meera. I mean c'mon! Finnish films that remind me of Indian films. A reading break with Omkara. Let's talk about ... R. Madhavan! The metaphysics of a naach girl. Sharafat. The world of Bala. Pithamagan, Sethu, Nandha. The good ol' days. Hum hai rahi pyaar ke.